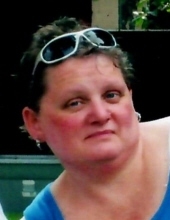 Sherri Lynn Williams, 54, of Clearfield, passed away Wednesday January 16, 2019 at West Penn Hospital in Pittsburgh. Born November 17, 1964 in Clearfield, she was the daughter of Andrew and Arlene (Hess) Williams. Miss Williams was a child caregiver. Sherri was a kind and gentle soul who loved children and was known as Aunt "Share Bear" to all. She had a quick laugh and a sparkle in her eye. She loved horses, holding babies and her family and friends. She will be dearly missed. She is survived by her father of Fort Lauderdale, FL 3 sisters and a brother: Vicki Williams of Dothan, AL, Lisa Sharp and husband Gary of Centre Hall, Dennis Williams and wife Brenda of Rocky Mount, NC and Tammy Huff and husband James of Erie, MI. Also surviving are numerous nieces and nephews. Funeral Services for Sherri Williams will be held at the Chester C. Chidboy Funeral Home, Inc. of Curwensville on Saturday January 19 at 12:00 Noon with the Reverend Scott Schultz officiating. Interment will be in the Friends Cemetery of Grampian. Friends will be received at the funeral home on Saturday from 10 AM until time of services at Noon. The family suggests contributions be made to the Clearfield Salvation Army 119 Byers Street Clearfield, PA 16830. To plant a tree in memory of Sherri Lynn Williams, please visit our Tribute Store. "Email Address" would like to share the life celebration of Sherri Lynn Williams. Click on the "link" to go to share a favorite memory or leave a condolence message for the family.